It's an old-fashioned risk-on/risk-off market at the moment. I have been closely watching AUD/JPY and it broke out on Friday but has pulled back 20 pips today. To me, that's the barometer of global markets this year. Even though equities have been rising, it was all about central bank shifts. Now that sentiment has stabilized around central banks being on hold and waiting to see more economic data. 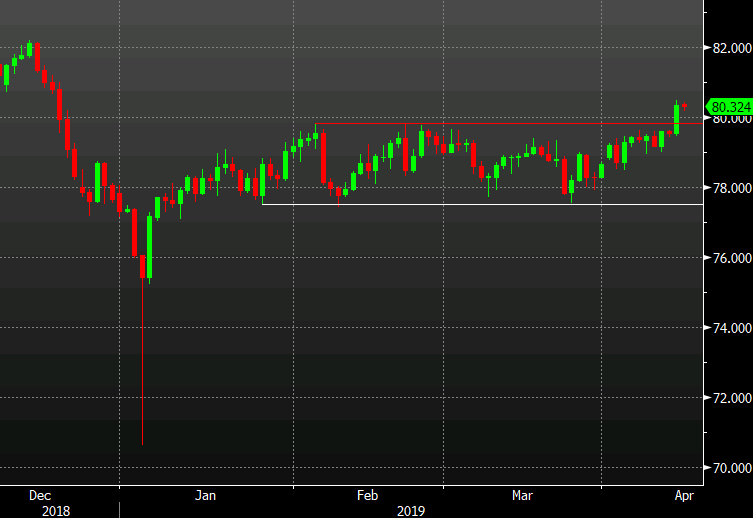 "The market has fully embraced the narrative that good news is good news, with EUR and risk assets rallying because of stabilizing data in China and Europe, as core central banks remain decidedly on the sidelines. Data that dispel concerns about global growth and signals reduced negative risks coming from trade or geopolitics are likely to keep high carry EM and G10 risk currencies bid vs. the USD, while EUR has found support as shorts are cut back. This week, earnings releases will provide another indicator about the underlying health of US businesses, and upside surprises might contribute to the positive risk momentum."